LED light bulbs don’t need to look like a machine from an alien world, at least not according to the Los Angeles based LED company Nularis, Inc., which now offers a full line of LED light bulbs that look just like the incandescent or halogen bulbs they are replacing. LEDs are known for their sharp, jagged looking metal edges, but Nularis has found that many people would prefer to have an LED bulb that looks like… a traditional bulb. The Classic line, now on sale on Nularis’ web store http://www.WholesaleLED.com, has a wide variety of LEDs that can identically replace nearly any incandescent or halogen light bulb. These LEDs bulbs use approximately 90% less power than incandescent and halogen lighting, but unlike other LEDs they will light up the room with a rich warm light that matches the traditional lighting they replace. For example, the 10 watt Classic Look PAR38 from Nularis shines with more than 900 lumens of light, roughly equal to a 75 watt incandescent bulb, and looks much the same too. Other LED brands require 12 to 15 watts to produce the same amount of light, which means consumers will now be able to save even more energy than before by using WholesaleLED’s Classic line. And, unlike many other LED bulbs that often give a spotlight effect, the Nularis Classic Look PAR38 features a 120 degree beam angle, allowing it to provide light for an entire room. 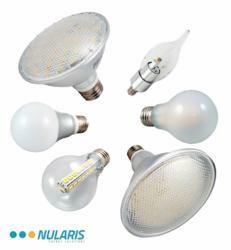 The Nularis Classic Look product line also includes a standard frosted light bulb that seamlessly replaces a 40 watt incandescent, both in design and rich warm light color. The Classic Look collection is available to retailers and electrical distributers at a large discount, but the public can also purchase small quantities directly from the company. To learn more, visit WholesaleLED.com.